Tourists and local residents praised the new, wider Kuhio Beach yesterday as the state's $500,000 sand replenishment project drew near an end. 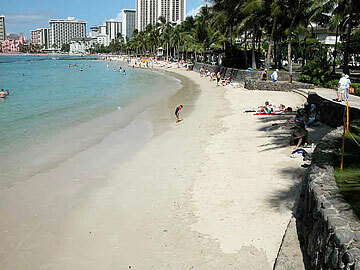 "I've been watching this every day," said Canadian John Sarich, who has been visiting Waikiki for 30 years. "It's good. They did a super job." Sarich had beach chairs for himself and his wife, Diane, on sand yesterday at the water's edge. A few weeks ago when they arrived for their annual visit, that spot was in the water 2,000 feet offshore. Since Nov. 28, American Marine Corp. has pumped 10,000 cubic yards of sand ashore to replace what's gradually eroded since the last significant replenishment in 1975. That's about 1,000 dump-truck-loads' worth that by Friday are to be applied between the Kapahulu Groin and the Duke Kahanamoku statue. This is how the Diamond Head side of Kuhio Beach looked before the project. 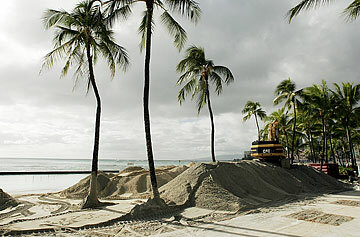 About half the sand has been spread on the more Diamond Head side of the two swim basins that front the beach. The remaining sand will be spread on the beach fronting the Ewa-side swim basin over the next four nights, said American Marine job superintendent Doug Fraser. During the monthlong project, "a lot of people have stopped and asked us how it's going," Fraser said. "About 96 percent are kind of excited about it." Former Oahu resident Colleen Robson, her husband, Mike, and 2-year-old daughter Kali were enjoying the wider beach yesterday on the Diamond Head end. "The last time we were here, our sand castles washed away, because the ocean was closer," said Robson, who now lives in Seattle. Some on the beach yesterday said it seemed like the work had taken a long time and some expressed concerns about small pieces of coral rubble that came ashore with the sand. Despite having to stop work a few days because of high surf, once pumping began it didn't exceed the 30-day estimate for how long the job would take, said Dolan Eversole, the coastal geologist managing the project for the state Department of Land and Natural Resources. The coral will be removed by normal city beach grooming once the project machinery is off the site, Fraser said. "I think it's good for tourists and good for locals and good for the size of the beach," Waikiki resident Angela Thomas said, as she ate a late lunch in the shade near the work site. "We're happy campers. We believe the beach-goers are happy campers," DLNR Director Peter Young said. "We've heard from lifeguards that a lot of people are enjoying the beach in the Kuhio area." "We view it as a success and hope it can be used in other areas across the state," Young said of the pumping process, which was tried for the first time with this project. 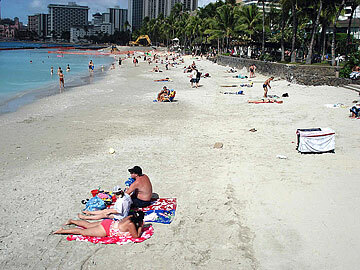 Now, the DLNR is requesting $1 million in the next state budget for study of further improvements for Waikiki beaches. The Kuhio project has been postponed multiple times since it was originally slated to start in fall 2004. Reasons included testing of water currents and delays getting permits. Then last year's 48 million-gallon sewage spill into the nearby Ala Wai Canal blocked the start. An October start time stretched to November because of unseasonal high surf on the Waikiki shoreline. Between 1939 and 2000, almost 250,000 cubic yards of sand were added to Kuhio Beach to widen it, DLNR records show.